Top quality handmade earrings, charms and necklaces. Here at Lynn's Jules we are proud to make unique handmade jewellery to the highest standard. We make our earrings, charms and bracelets from a diverse range of beads and semi precious stones to the highest standards. If you are looking for handmade earrings for sale you have come to the right place. 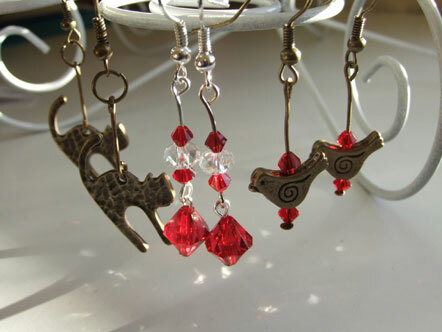 Here at Handmade Earrings we sell a large variety of styles of earrings, charms and bracelets. If you are looking for some unique handmade charms the we have a great selection for you to pick from. From mobile phone charms to bag charms why stop at decorating yourself, personalise your belongings with our attractive handmade charms. We also make handmade bracelets and necklaces also made to the highest standards. If you like to coordinate your jewellery then why not try on of our matched sets of bracelets and earrings.